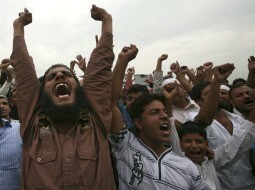 The now infamous Koran burning by Florida pastor Terry Jones has created hysteria in the Muslim world. In Afghanistan alone, some twenty people, including U.N. workers, have been killed and beheaded to screams of "Allahu Akbar!" Western leaders around the globe—including Obama and members of Congress—have unequivocally condemned Jones' actions (without bothering to point out that freedom of expression is a prized American liberty). Many are even blaming the deaths in Afghanistan directly on Jones; Bill O'Reilley says he has "blood on his hands." Afghanistan: A Muslim convert to Christianity was seized and, according to sharia's apostasy laws, awaits execution. Bangladesh: A Christian man was arrested for distributing Bibles near Muslims. Since Wednesday, thousands of Muslims have been rioting, injuring dozens—not because of Jones, but in protestation of women's rights. Egypt: A Muslim mob burned down another Coptic church and dozens of Christian homes; when Christians protested, the military opened fire on them while crying "Allahu Akbar," killing nine. Another mob cut a Christian man's ear off "according to sharia." Ethiopia: Muslims went on a rampage burning down nearly 70 churches, killing at least one Christian, and dislocating as many as 10,000. Christians living in Muslim majority regions are being warned to either convert to Islam, abandon their homes, or die. Malaysia: Authorities detained and desecrated thousands of Bibles. Pakistan: Two Christians were shot to death as they exited church; a Christian serving life in prison for "blasphemy" died in his cell under suspicions of murder. Saudi Arabia: An Eritrean Christian has been arrested for sharing his faith with Muslims and is facing the death penalty; other missionaries continue to languish in Saudi prisons. Somalia and Sudan: Christian girls—including a mother of four—were recently abducted, raped, and killed for embracing Christianity. It should be borne in mind that none of these atrocities were performed in retaliation to Jones' Koran burning; they're just business as usual in the Muslim world. Moreover, the above list is but a quick and cursory sampling of the very latest in Christian suffering under Islam. Were one to include persecution from just a few months back, one could also mention the jihadist attack on a Baghdad church, killing 52 Christians; the New Year's eve Coptic church explosion, killing 21; Muslim rampages that destroyed several churches in Indonesia, Nigeria, and the Philippines; Iran's "round up" of some 70 home-worshipping Christians; and Kuwait's—a nation that owes its very existence to U.S. war sacrifices—rejection to build a church. Then there are the countless atrocities that never make it to any media—the stories of persistent, quiet misery that only the victims and local Christians know. One would have thought that all this was at least equally deserving of media attention and Western condemnation as the burning of a Koran. Worse, whereas only Jones is responsible for his actions, many of the aforementioned savageries—arresting and executing Christian missionaries and Muslim apostates, destroying or outlawing churches, seizing and desecrating not one but thousands of Bibles—are carried out at the hands of Muslim authorities and governments deemed U.S. "friends-and-allies." Such is the surreal and increasingly irrational world we live in, where irate Muslims and groveling Westerners obsess over the destruction of one book while ignoring the destruction of many human lives; where a guaranteed and hard-earned American right—freedom of expression—receives a lot of condemnatory huffing and puffing from those charged with protecting it, while murderous and barbarous—in a word, evil—behavior is devoutly ignored.